It's time to raise the bar, subscribe to Kevin's blog "Revolutions"
Life is not measured in years; it is measured in moments. Today I am 30 years old… well that is it has been 30 years since my accident that left me paralyzed from the chest down and confided to wheelchair. It all seemed like a dream and when I woke-up; I was face down in a hospital bed with massive internal and external injuries. I had to start thinking about overcoming adversity. I didn’t know where I was and I had a lot of overcoming adversity to do. I could vaguely recall some sort of explosion, but it didn’t seem real, why should I have to be overcoming adversity like this? I was twenty four years old, newly married, with a baby on the way. I’d finished my college education at Kansas State University and gotten a good job with the US Department of Agriculture (USDA) as a federal inspector inspecting grain elevators all along the Gulf Coast. Things were moving along great when life, literally, blew me away. It took tremendous spiritual inspiration and inspirational faith to help me in overcoming adversity like this. The challenges were tremendous and the deep depression was overwhelming. These were just some of the things I would have to overcome in order to get my life back. If you’ve never worked near a grain elevator, it might not sound that dangerous or explosive. After all, what could be so risky about a bunch of corn milo, soybeans and wheat lying around? As it turns out, quite a bit! You see, when the grain is moved, the grain dust that is generated becomes volatile when it’s heated and compressed. 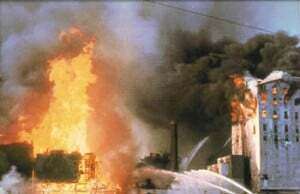 Grain dust is more explosive than dynamite and gasoline and approaches atomic energy based on the tremendous devastation caused by a grain dust explosion. Overcoming adversity like this can be an almost impossible task. The smallest spark can set off this Atomic bomb-like force that takes place in a grain dust explosion. And on April 7, 1981 that Friday afternoon at 3:10 PM CST in Corpus Christi, Texas, that’s exactly what happened. As part of my inspection, I’d noted that the dust collection systems, meant to take the deadly mixture out of the air inside the elevator, weren’t working properly. The head engineer for the Port of Corpus Christi who I had informed about the situation was not overly concerned, as he said it would cost millions to repair and they could not justify the expense at the time. Overcoming adversity within the corporate system is difficult especially when you are telling them of a problem that to fix would be a costly expense for the company. 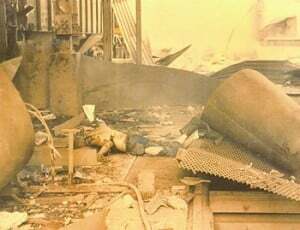 At the time the company did not value the lives of their inspectors as high as they did for the cost to fix the problem. I have a tremendous passion for increased safety in the workplace that’s why I became a corporate safety speaker & business safety speaker, because I want to do everything I can to make sure no one has to endure the pain, be crippled for life, electrocuted, severely burned or killed because of safety negligence. Not long after, I heard something that sounded like thunder, but felt like an earth quake. Everything was rattling, the ground was shaking and things were falling off shelves. In fractions of seconds the cracking and popping was so loud it seemed like it was going to split my head wide open. I dug deep for my spiritual inspiration and I hung to my inspirational faith and I believed that some way I could survive what was about to happen. All of us are going to meet a time in our lives when there was a before moment and there was an after moment. Most people like me want to believe and hope you will be strong enough to keep going forward no matter what it was that happened because things will never be the same again. I prayed for the strength to go forward and to help me in overcoming adversity that was an incomprehensible force. It was overcoming an adversity like I had never seen or heard before, because those atomic like force grain dust explosions were headed right for us. The floor jumped a foot up and down beneath us. We all knew what that meant; there was no doubt what was happening. The explosions grew in intensity and as I looked out the window of the USDA building. I saw those grain elevator silos, each with a two-foot thick concrete walls that were reinforced with 1 inch thick iron rebar built to withstand tremendous pressure, being blown apart like paper. I saw chunks of concrete weighing tons being thrown 100s of feet though the air coming right at us. I knew it would take all my spiritual inspiration and inspirational faith and a miracle from God to survive this. I turned a caught a glimpse of my supervisor Albert Tripp out of the corner of my eye and the look in his eyes was of absolute terror. I noticed the blood drained from his face. He was pale white and he seemed unable to speak. 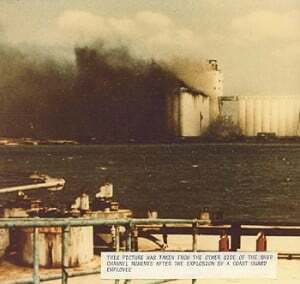 Before another breath could pass, the biggest and most powerful grain dust explosion imaginable caught us. Experts determined after the explosions that there were twelve grain dust explosions that ripped through the grain elevator that day at 1500 feet per second. 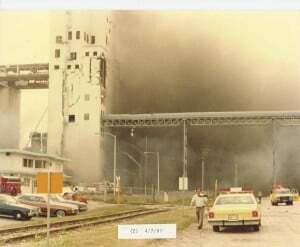 When the biggest grain dust explosion came, the force from the blast hurled me right through the roof of the USDA office I’d been working in and completely destroyed it, leaving only the concrete foundation. I flew up over 100 feet in the sky, and over a two-story building, and finally landed on my head and shoulders in a concrete parking lot over 300 feet away, the length of a football field. 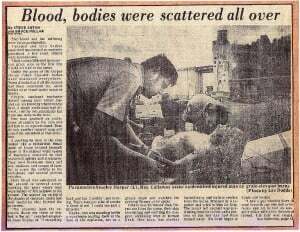 When the paramedics arrived, they found my body broken over at my chest like one would bend at the waist, my chest was crushed, and blood and cerebral spinal fluid oozing out of my nose, ears, and mouth. My skull was crushed, lungs collapsed, broken bones, and massive internal and external injuries. I could feel the live my soul slipping away out of my body. Although I was breathing when the paramedics found me, my vital signs where so low that I wasn’t expected to make it. I was not aware of it at the time but in the case of tremendous accidents like the grain explosion, the paramedics do what is referred to in the medical world as triage. They take people with the best chance of survival. 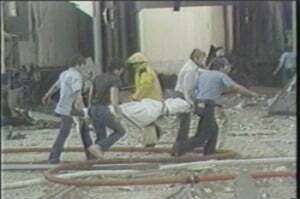 Even in Corpus Christi, a city of over 350,000 people and all the suburbs, they ran out of ambulances and stretchers. So I was about to be left but thanks to the good Lord and one paramedic who didn’t want to leave me. I made it to the hospital on a blown off door in the back of a station wagon. They say the Lord works in mysterious ways. I don’t know what the odds were for me but they had to be astronomical. I knew the Lord must have a powerful purpose for my life. After three to four weeks, and several surgeries, I was comatose and all but gone. In fact, I can remember a conversation between my doctors and a nurse who had stopped in. She asked what my prognosis was. They replied that they had done all that they could, but that I was going to die. I can’t blame them for saying so. They didn’t think I could hear anything, and the odds were with them. Realistically, I shouldn’t have survived. God was there telling me to hang on to Never Give Up and I fought for life with every bit of whatever strength I had left and I never lost my faith in God that I would survive. Ultimately, even though my physical injures didn’t kill me, the emotional trauma almost did. Depression, self-doubt and pity took hold, dominating my thoughts and reducing me to a shell of my former self. All the medial specialist in South Texas believe that things didn’t look good for me and I would not live for much longer. I realized that my life was over. It wasn’t only my arms and legs that had been rendered immobile, but my motivational spirit had been lost in the blast as well. I was also humbly honored to be the first person with a disability and paralympian appointed to the President’s Council on Physical Fitness & Sports (PCPFS) by President George Bush and was the only person reappointed to the President’s Council on Physical Fitness & Sports by President Bill Clinton. I have worked alongside PCPFS chairman, former California Governor and long time friend who I deeply admire, the honorable Arnold Schwarzenegger. President George W. Bush appointed me in 2004 to a special committee working with the PCPFS and HHS to come up with a plan to improve fitness and health for children with disabilities and we created the National Initiative on Physical Fitness for Children and Youth with Disabilities called the “I Can Do It, You Can Do It” program. I became a top 100 motivational speaker and inspirational speaker. I was a principal actor and played next to Tom Cruise in the academy award winning movie ‘Born on the 4th of July’ directed by Oliver Stone. I worked with the Kansas State University football team with Head Coach Bill Snyder as the motivational coach and inspirational athlete to participate in what was later known as the ‘greatest turnaround in college football history’ and maybe all of sports. I also had the opportunity to learn from many other division one coaches who I admire greatly, such as Bob Stoops, Head Coach at the University of Oklahoma and his brother Mike Stoops, Head Coach at the University of Arizona. There are a host of other D-1 coaches that I greatly admire, as well as many NFL starts, some of which have played and won the Super Bowl. Now my mission is to travel the country spreading the word of proper fitness and nutrition to today’s youth, parents, teachers, community and state leaders, and local and state officials through the ‘Big Push Across America’ tour. 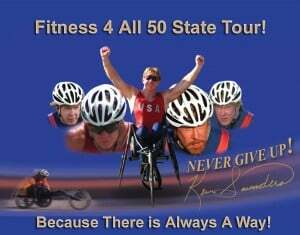 We will take what we have learned from the ‘Big Push’ and continue our mission through the ‘Fitness 4 All 4 50 State Tour’ in the Fall of 2012. 5:00 a.m. CST – We departed the Baymont hotel for KTHV CBS Channel 11 interview. We arrived at 5:40 a.m. and met with producer Laura Kelley. As I mentioned in previous blogs, I have to get up 2 to 3 hours earlier than when I was on my feet to take care of my medical needs. Because I am paralyzed from the chest down, little everyday things like getting dresses take 3 times longer than the average person. I remember the good old days when I could hop out of bed, shower and be out the door in 10 to 15 minutes but now I am on a mission to bring the message of proper fitness and nutrition to all. I went on the air at 6:35 a.m. with anchor Amy Fox. The interview lasted approximately 5 minutes and I was able to cover all of our main points for the ‘Big Push Across America’ promoting proper fitness and nutrition to youth, parents, teachers, community and state leaders and local and state officials. Noon CST – After lunch, we returned to the hotel and uploaded the photos into the laptop. We had been having problems with our wireless modem all week, but we were able to get a slow connection. Andy called the wireless company and tried to figure out what was wrong with the high-speed connection. After two hours on the phone, going through step after step of modem configuration, we were told that the card would not work because we were out of the service area of our provider. When Andy got off the phone with tech support, we noticed that not only had the high-speed connection not been established, but now the slower connection was also unavailable. 2:00 p.m. CST – Because our email was down, Dora and I dropped Andy off at a local store to send out some picture files. We also wanted to get some of the larger proclamations scanned, but the store did not have a scanner large enough. While Andy was at Kinko’s we made some copies of our Beta tape of b-roll at a store in downtown Little Rock, AR. 7:00 p.m. CST – We returned to the Baymont hotel and went out for some dinner. Keep up the faith and you will find a way to reach your goals. Keep Going for the GOLD! Never Give Up! Kevin Saunders is a World Champion Paralympian, motivational speaker, athlete (with multiple gold medals) and author. Kevin Saunders was the first person with a disability appointed to the President’s Council on Physical Fitness Sports (only 20 people are selected for this nationwide) by the President of the United States. Kevin Saunders was first chosen to be appointed to the prestigious Council by President George H.W. Bush and was the only person reappointed by to this Council by President Bill Clinton and he was reappointed again by President George W. Bush as a constituent expert to the President’s Council on Physical Fitness & Sports. Learn more about Kevin’s story and accomplishments. Happy New Year! Start Strong, Stay Strong & Finish Strong all year long! Thanks, and Happy Holidays to Everyone! Sign up for Kevin's newsletter to receive monthly tips and news. Copyright © 2018 Kevin Saunders. All rights reserved. Web Design: Catalyst Studio, Inc.